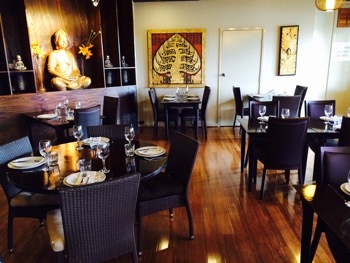 Thai Chiang Rai in the Woden Southern Cross Club certainly has the nicest setting for lunch in the Woden CBD. Serve sizes are generous and if you usually only need to order one main per two modest appetites to try some good dishes but not end up with more food than you want. But an odd number (e.g. three people sharing) can be tricky. One solution is to order one main and one smaller express lunch. 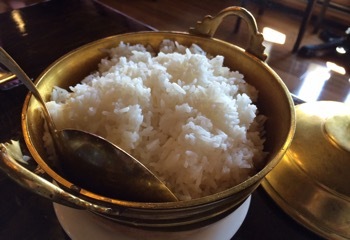 But then it can be tricky to order the rice in the right amounts. Another solution is to order one curry and one of the special fried rice (and skip the plain rice). 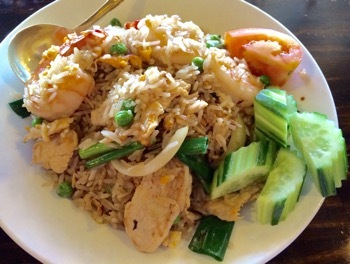 The chicken and prawn fried rice $16.90 is a good option. The Jungle Curry with Pork $17.90, is very good (possibly the best dish so far). It is very light, no having any cream or coconut milk added, with fresh flavours. It is very spicy though, if chilli bothers you. 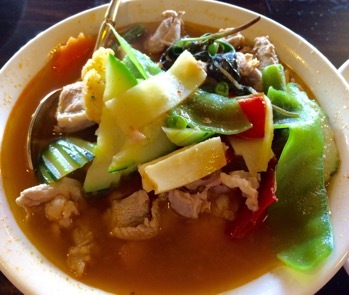 The pork and chicken meats are tender at Thai Chiang Rai and good options to order for the curries and stir fries. (The beef is not so tender). If you are wanting a light meal (also light on price) then the $9.90 serve of plain rice would also be good with the Jungle Curry with pork or chicken (one serve of each for three). Canberra Southern Cross Club members are offered a 10% discount. At lunchtime a glass of wine is $2.90 (although this may be increasing to $3.90 soon).